Waking up at 11:41 a.m.
Cinnamon Raisin Bagel with Vegan Cream Cheese. Orange Juice. Papaya. Ana had texted me last night with, "I just want to say that I'm reaaaaaaally happy to have youuuu in my life!!!! < 3 You're still the sweetest." I respond with, "I just want to say you fill me up with so much positive energy. You're the sweetest." Ana: "Waking up to that this morning added more brightness to my day! I only want to fill you up with positivity! I have a lot of it, and I will continue to keep sharing it with youuu! :D"
For lunch: Sasha's Homemade Stew with Potato Bread. Kinder Chocolate. Football Sundays bring business for delivery guys. I would say 7 out of 10 customers I deliver to are watching the game. I get through the night with hope and determination. Off work and back home at a reasonable time, 10:30. Egg Vegetable Fried Rice. Kinder Chocolate. Watching There Will Be Blood (2007). Kevin's downstairs with an exceptionally "high" face. He always gives me a hard time when I go on these late-night physical outings by myself. Me: "Hey Kevin, guess what I'm about to do at 3 in the morning?" Taking a jog around the neighborhood with basketball in hand – practicing ball handling in the street. Sipping on a fall ale. 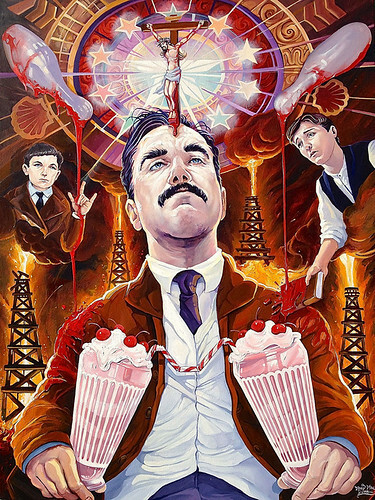 [i] There Will Be Blood. Dave MacDowell.